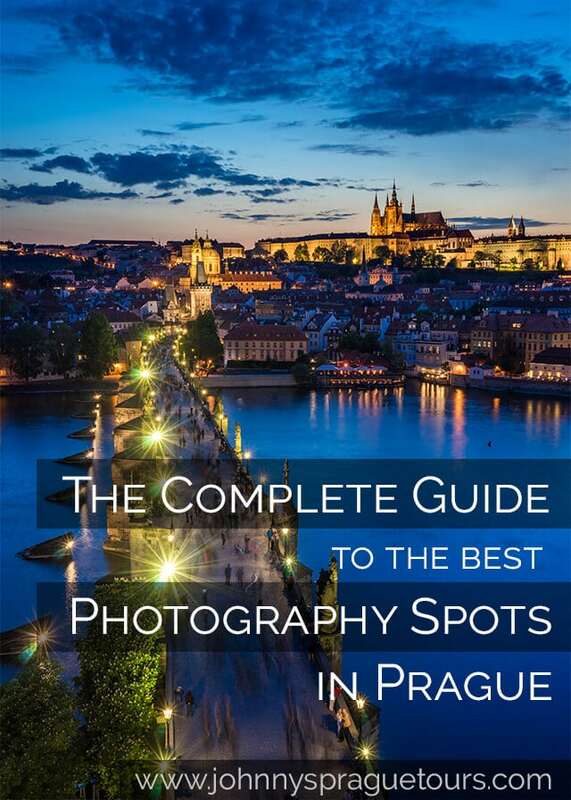 In this detailed guide, local professional landscape and travel photographer Jan Miřacký, who has been running award-winning photography tours in Prague, shares his knowledge on his favorite locations and gives you pieces of advice how to take stunning cityscape images at each of these spots. Enough with the sales pitch. 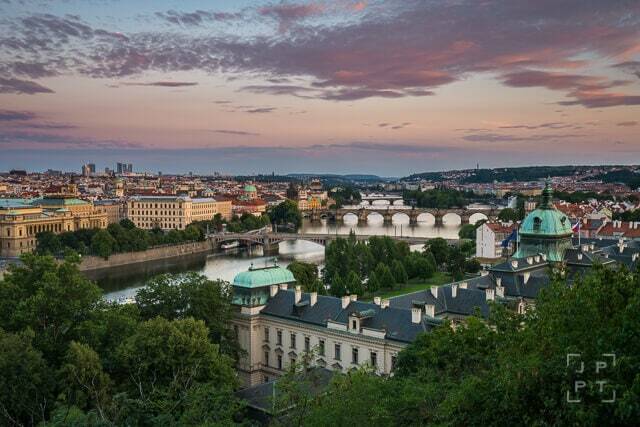 Are you ready to explore Prague’s most photogenic places? Let’s get into it! 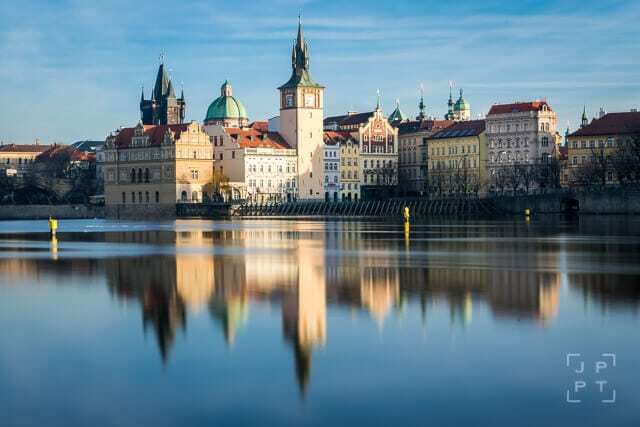 This article will be updated regularly as I explore and discover new photography locations and I want it to become a blueprint for landscape, cityscape or travel photographers coming to photograph Prague. This guide to best photography spots contains almost 50 spots now and will grow larger in the future. Disclaimer: All pictures are copyrighted by Jan Miřacký (2013-2018). Please, don’t use them without his explicit written permission. 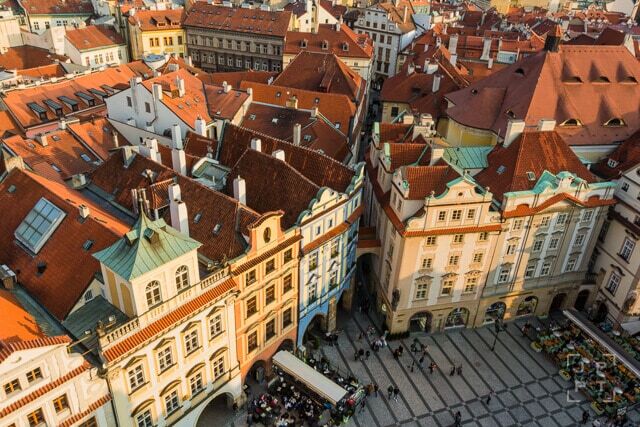 Prague’s historical city center where all the iconic pictures wait to be taken is very compact and walkable. Save this map on your smartphone in Google Maps and don’t miss a single spot as you walk through the city. 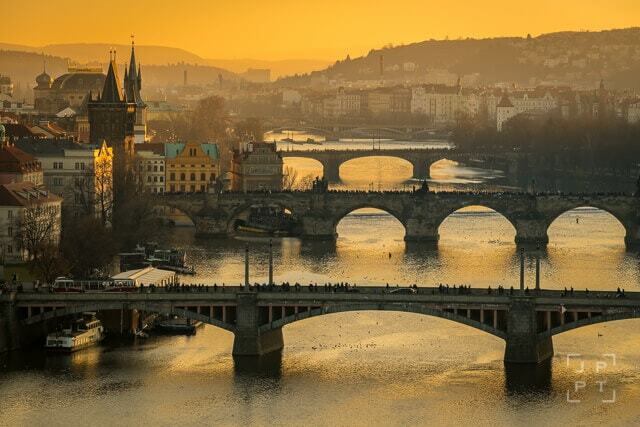 Charles bridge is the most photogenic landmark in Prague. No doubt about that. It’s an amazing location for both sunrise and sunset as well as night photography. 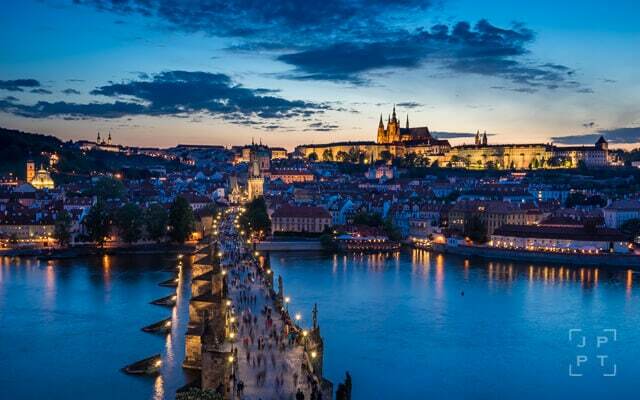 I will break it down into multiple locations on the Charles bridge itself or in its immediate proximity in order to give you concise information which is easy to navigate. 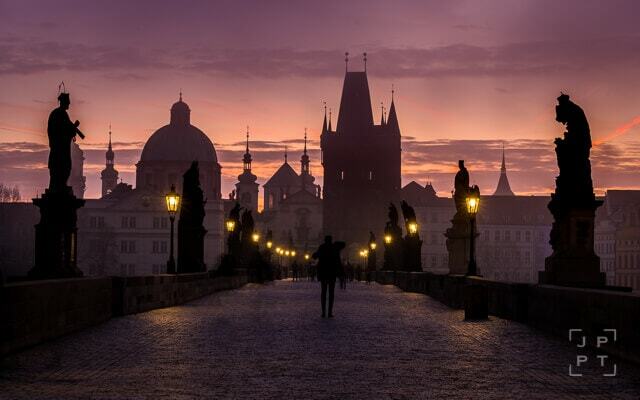 In my opinion, this location offers one of the finest views of the Charles bridge, especially at night. 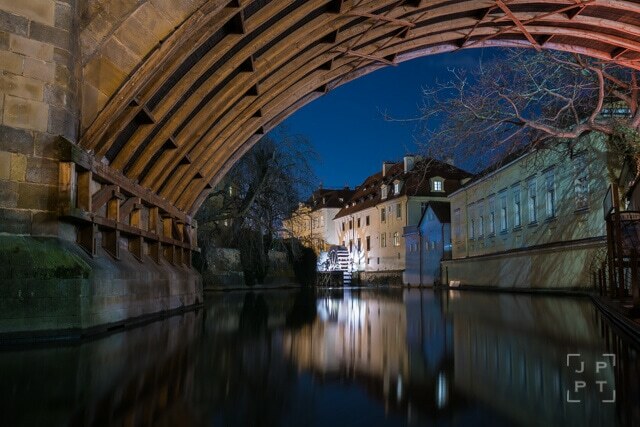 Vltava river adds gorgeous reflections to your long-exposure shots. Here, you have a high chance of creating your keeper from Prague. Both of these spots are best visited during the evening blue hour but in certain situations can be shot at even during the day or in the early morning. There is a playing field for kids which is closed later in the evening sometimes (the official opening hours don’t really reflect the actual opening hours, from my experience), so you will shoot from the spot right next to it. There is a high fence that you ideally need to get your camera over. If your tripod is not tall enough, shoot through the bars. Make sure that you won’t get the fence in the corner of your shot. In order to get a different, more wide-angle, perspective of the bridge, get inside the playing field and shoot from there. The best spot is between the third and the fourth tree counted from the Charles bridge. I highly recommend this location for the evening blue hour as you get the reflections of lights on the bridge on the waterfront and it looks amazing. This side of the bridge is facing west and therefore is great to shoot sunsets, the blue hour or the first sunbeams hitting the Prague castle area early in the morning. Opening hours: 10 am until 6 pm (November – February) / 8 pm (March and October) / 10 pm (April – September), note that last entrance is 30 minutes before the closing time. In the summer, they tend to start asking people to leave 30 minutes before the closing time, you can usually negotiate to stay until 15 minutes before closing. 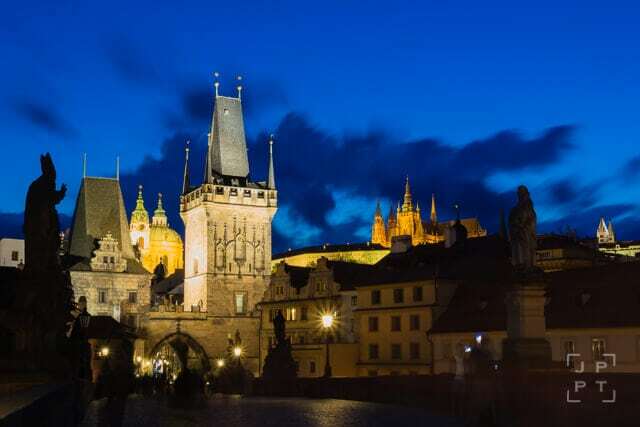 This location is another one that can give you the iconic postcard shot of the Charles bridge and Prague castle. This is not a secret to general tourists either so you have to fight in order to secure your spot or be there 30-60 minutes ahead of time of your desired shooting. You want to be shooting from the very top of the tower, there are no windows. Space there is very limited and practically doesn’t allow you to build a tripod (at least not properly). That’s a pickle, you think. Let me cheer you up. The wall around the viewing area is leveled and I use it to replace a tripod (don’t let go of your strap though, safety first). It’s handy to have something to put under your camera body in order to control camera tilt and adjust the framing to your liking. Once you are happy with your shot, walk around and don’t forget to photograph the view on the other side. You can take a nice picture of a dome of the Church of St. Francisco. Positioned right next to the Old Town Bridge Tower, it offers a great vantage point to photograph the Charles bridge along with Prague Castle. 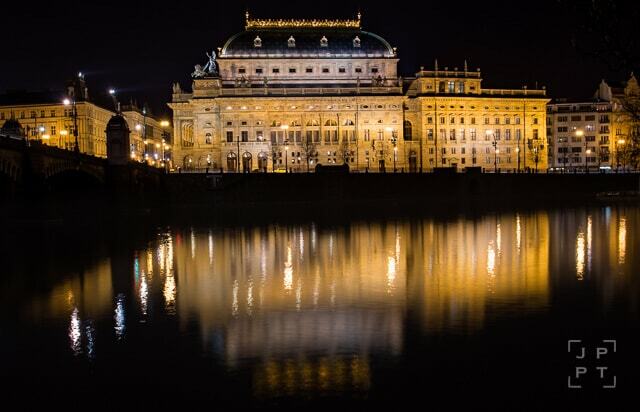 Although at night, I suggest shooting only the Prague castle area without the Charles bridge. There are way too many lights in the frame and the composition becomes cluttered. Don’t crop the picture too tightly on the bottom and leave some space for reflections of the Castle area. On a cloudy day, it’s a lovely spot for trying out some long-exposures. 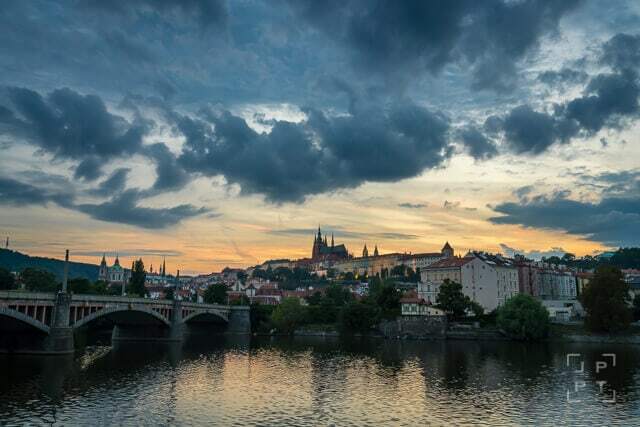 Join Jan’s photography tours in Prague and improve your photography skills while exploring the beautiful city of Prague. Once you feel you used all possible compositions with your telephoto lens, put your wide angle or midrange zoom on. Now notice the pattern on the ground formed from cobblestones. What if you use it as a leading line? Heck yeah! Get on your knees, get close to the line of cobblestones on a side and frame it nicely. After that, try also some really wide angle shots from the center of the bridge. Perhaps it can be your next cover photo on Facebook. Framed shots are always something to look for. Wait for the lights and use the lamp as your foreground element. Possibly, you can play with a telephoto lens and bokeh to create interesting semi-abstract images. A simple shot with a small square framed by houses from both sides. As an extra, you can create more depth by including the stairs. 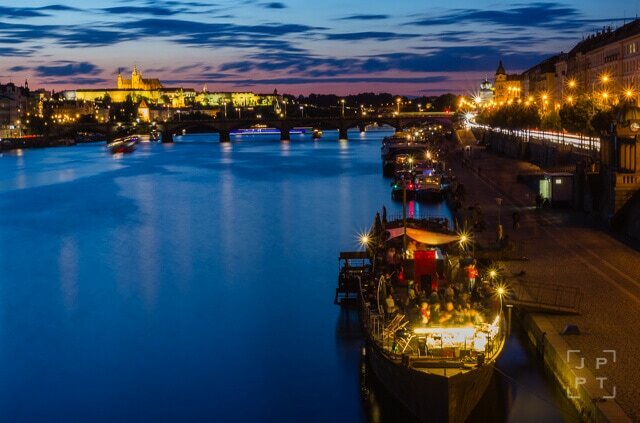 Get an elevated view of the channel right from the Charles bridge. A simple shot best shot in spring or early summer when trees are in bloom and abound with colors. Just from around a corner from the spot 1.2.2, you can find Novotného lávka and beginning of Smetanovo nábřeží. 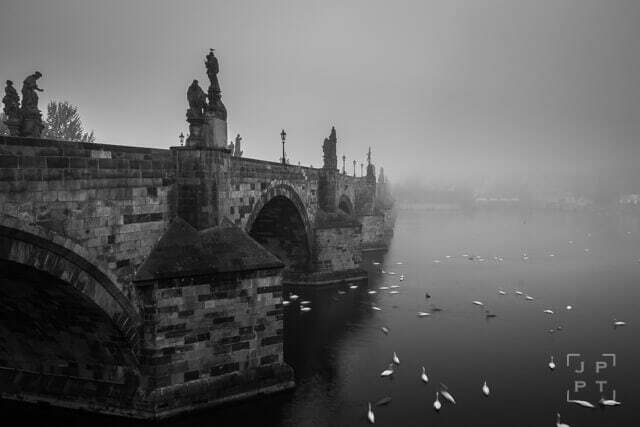 Both locations offer many interesting views of the Charles bridge together with Prague Castle. I prefer Novotného lávka slightly more as it gives me cleaner composition and fewer distractions. After you stop wondering who’s the guy on the statue behind you (it’s Bedřich Smetana, one of the best Czech composers of all times), have a look at the marvelous view ahead of you. Please note, that this is a place where a restaurant serves hungry clients, so you best avoid going there in peak times in the high season or if you dare, be quick and invisible. It’ll be appreciated by dining guests. I mainly say that you do you expect to go there in the summer and shoot a time-lapse there for one hour, even though the result could have been remarkable. I bet you are wondering what those logs are there for. Right? It’s an ice-breaker to protect the riverbank from larger chunks of ice and break it into harmless smaller ones. Does the river freeze? Not anymore but I think it used to. Anyways, you can capture this ice-breaker together with that nice looking red building in the background named Bellevue. Truth to be told, I was hesitant to include this spot as I don’t like it much particularly but I know that it’s quite popular among tourists and even some local photographers. I let you judge it on your own. It gives you more or less the similar view like 2.1.1 but with more distractions. The only thing that I find interesting about this spot is that if the sky is dull, you can frame the sides of Prague Castle with leaves of trees and cover the uninteresting gray clouds. Do you want to learn how to take images you see in this guide? 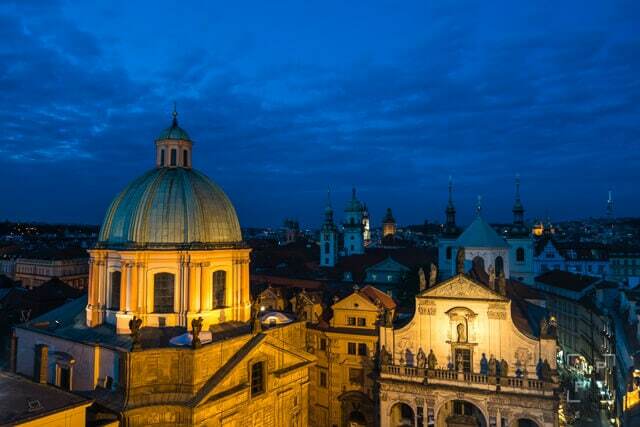 Check out our award-winning photography tours in Prague. If you have already done a research on iconic images from Prague, you must have seen this already. Bridges lining up over the Vltava river photographer from an elevated viewpoint? Yes, that’s exactly what I’m going to show you now. There is a nice little viewpoint where you can take pictures. It can get quite busy for the blue hour, so be sure to be there early enough in order to claim your spot. When you have a midrange zoom, do the full scene with a special focus on the river and its bridges. You can use Straka Academy (Government building) as a foreground element, too. Once you switch to your telephoto, get more details and go closer. The left side of the river is more interesting, so take advantage of that and show all those beautiful colorful buildings around the Charles bridge. When you feel like you’ve shot enough in this direction, look around what else may catch your eye. 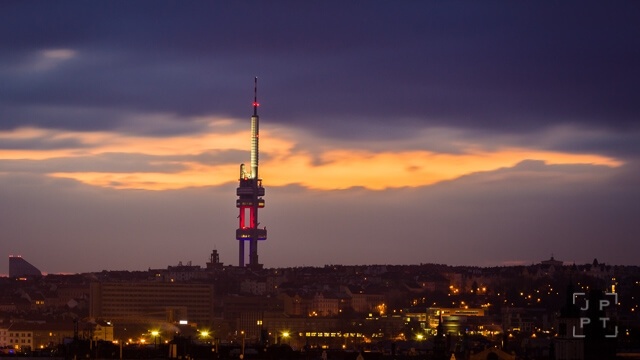 I personally like the Týn Church at the Old Town Square at night from here and also the TV Tower in Žižkov is worth trying if you have an interesting sky. Since this viewpoint is only one minute walk from the previous spot, go give it a go as well since you are up there. Both give you a slightly different view and I prefer the previous one from Hanavský pavilion but I know that some photographers actually favor this one. Are you short on time in Prague and want to maximize your shooting time? 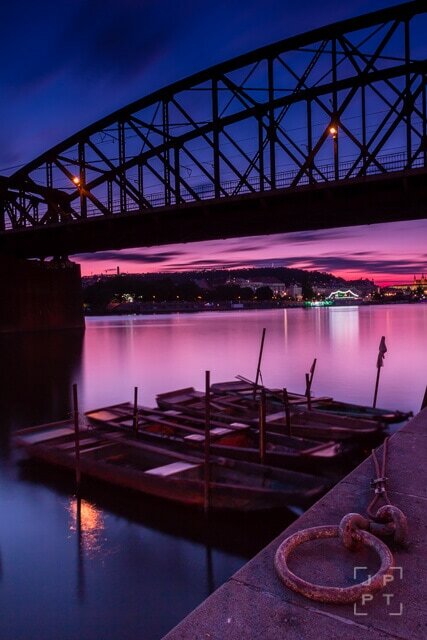 Have Jan to guide you around the best photography locations in Prague and help you to get the best shots possible. 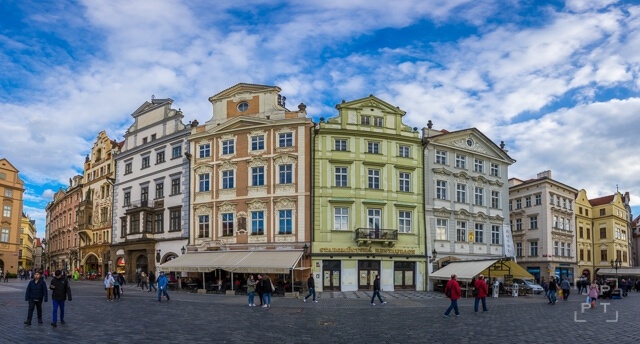 If you could only visit one square in Prague and photograph there, let it be the Old Town Square. It is the historical square in Prague with a lot to see, photograph and experience. Having said that, you’re worst enemies will be other tourists. The square is crowded in typically between 9:30 am and 7:00 pm. Choose morning times for your photography here if you don’t want to be bothered and having your tripod kicked around. Let’s start off with the main sight on the square. 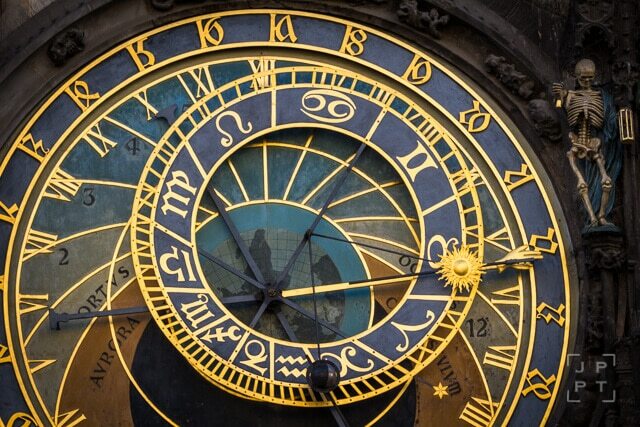 UPDATE: At the moment of writing the article, the whole building is undergoing a reconstruction and there is a scaffolding all over it and the Astronomical clock was taken off until August 2018. The observation deck is open to the public. You can check the current state on the official website. The building from this angle doesn’t look very enticing and this is why we are going to get to details right away. Stand close to the restaurant right opposite of the clock. This gives you less amount of distortion. Try different variations, include those statues on the sides to make the frame more interesting. Be creative. It’s all about composition here. Just another interesting angle. Leave some space on the sides in order to be able to correct the perspective. In order to get a clear view of the Old Town Hall, you need to get up earlier and be here before people start going to work and typical tourists hit the streets. Incorporate your foreground element by getting low and frame the cobblestone pattern on the ground. Your view cannot get much better than this. 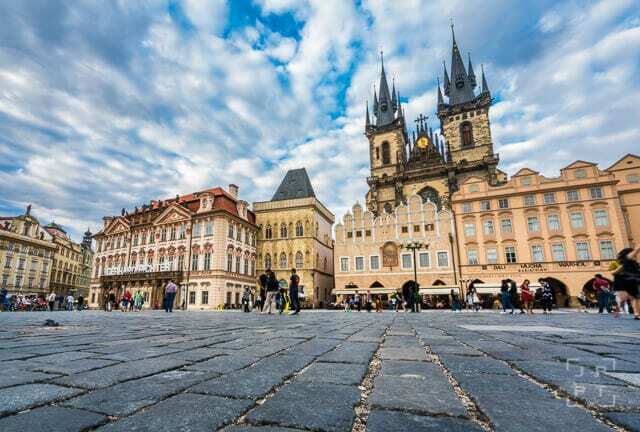 A stunning view of the Old Town Square with dominating Týn Church, red roofs of the city center and many architectural details waiting for your attentive eye. It takes two lifts to get up there but sometimes it’s too crowded that it’s smarter to walk. Please, obey the direction of walking. It makes everything so much easier for everyone else. The space on the top is very confined and doesn’t really allow you to build a tripod (also, I believe it’s forbidden). Walk around with a wide angle or a midrange zoom first and then do the second round with a telephoto. Don’t forget to look down and look for interesting patterns. On the way down, consider stopping in order to capture some creative shots of the lift leading to the very top. Photograph of the Old Town Hall Tower along with the typical architecture is a nice one to shoot at the square. Look for fast-moving clouds or dramatic sky for an added interest in the sky. Do you like one-on-one learning experience? 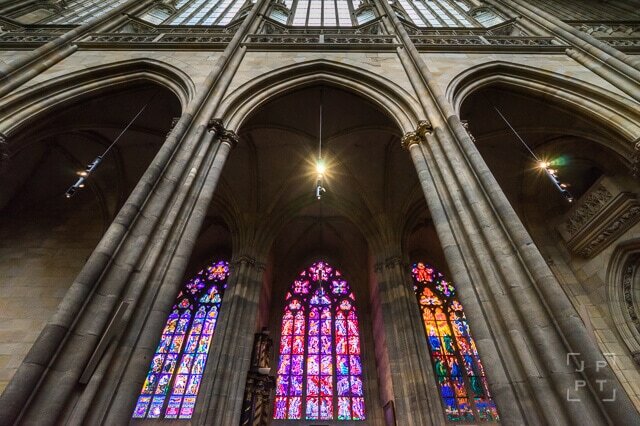 Sign up for a private photo tour in Prague with Jan.
Let’s stay on the square and take some photographs of the Týn Church and a few more spots in the immediate surroundings. In the late afternoon, you have to accept one more challenge and its tourists walking around. But even if it seems impossible at first, there are breaks in influxes of people that bring 30-second-long windows of opportunities. In order to achieve a slightly different shot than everyone else, get low, get a bit dirty and include those cobblestones in your foreground. Be careful so you don’t crop the tops of the Týn Church. Most of the time, there are horse carts for tourists waiting in the corner of the square. Why not use it to our advantage as photographers? Let’s include the horse in your frame along with Týn Church. 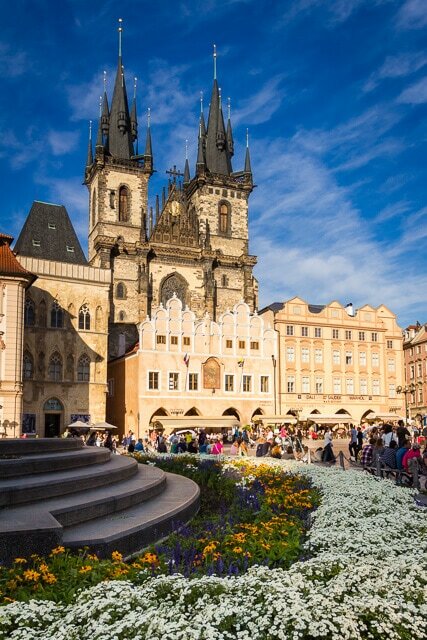 If you visit Prague in the spring or summer, you may find some beautiful colorful flowers planted around Jan Hus memorial. This provides a great foreground for a shot of Týn Church. Don’t be afraid to cross the chain, just be thoughtful for the flowers and don’t step on the soil. 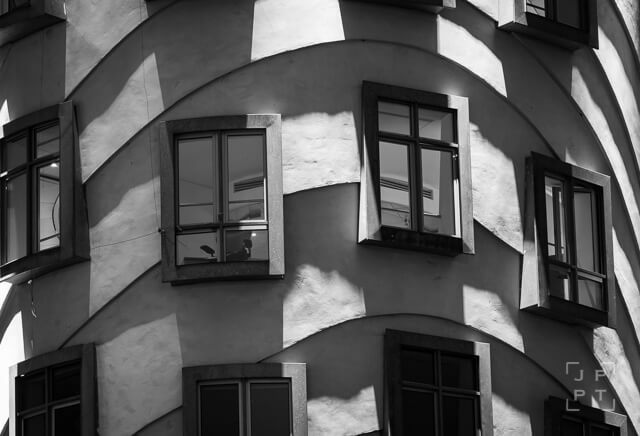 The houses on the square represent classical Prague architecture and as a bonus, they curve. This gives you a good opportunity for a picture as they houses differ in colors and create an interesting formation. Good either with a wide angle lens or better with a stitched panoramic picture. Don’t forget to shoot the panorama vertically and be quick between each shot so people don’t move much between each frame. Only a 3-minute walk from Old Town Square, you find a cubist house of the Black Madonna. Inside, you are not allowed to use a tripod, nor move any sign table. Be respectful, otherwise, a security guard will kick you out. 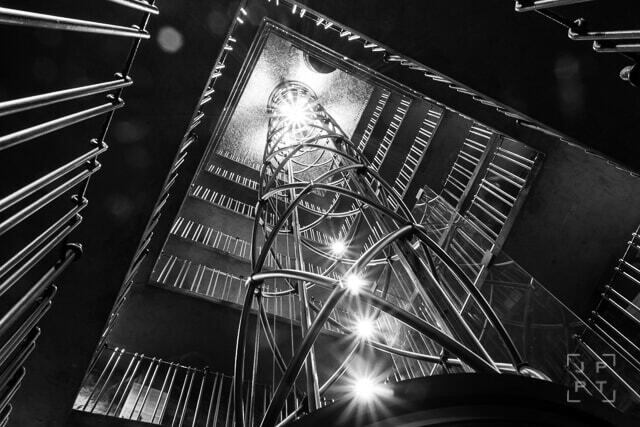 Right from the ground floor, come to the staircase and look up. 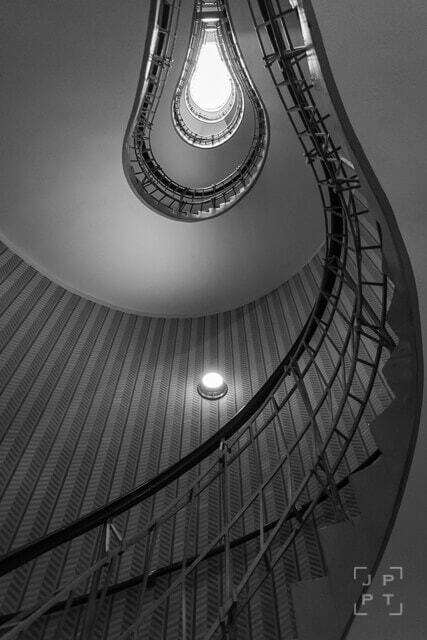 You see a staircase spiraling up and finishing with a shape of a lightbulb, therefore the name. Keep it simple, look for lines, contrast, and symmetry. Don’t forget to set high ISO like 3200 in order to get a sharp image while keeping your aperture at about f/5.6 or even slightly more open. Walk to the third floor and shoot from top to the bottom. 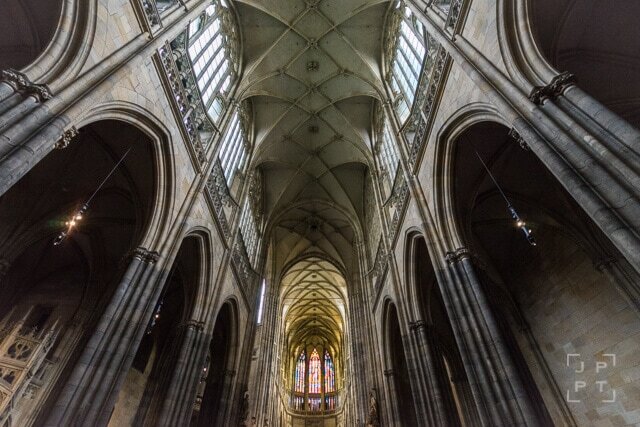 You get a different perspective and still a very nice picture that will stand out in your collection of interior shots from Prague. 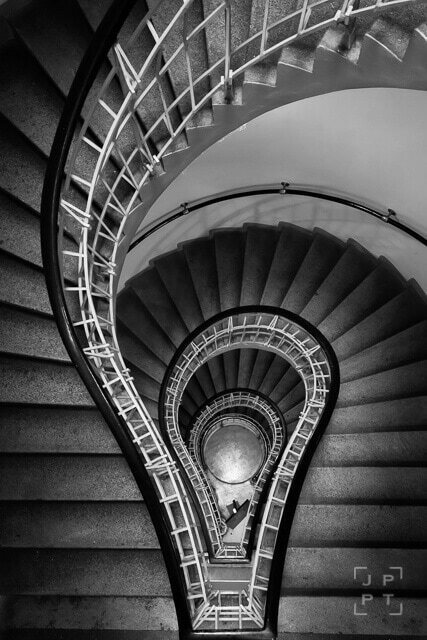 Our photography tours are the best photo tours in Prague. It’s not just us saying that, it’s 200+ clients’ reviews on TripAdvisor. Powder Tower is one of the accessible towers where you can climb and get bird’s eye perspective. Beware, there is no lift and you have to walk up the stairs. Truth to be told, the interesting view is only in one direction facing the Old Town Square. Don’t have your expectations too high. If the scene is way too wide for your lens, try a panoramic shot like I did. 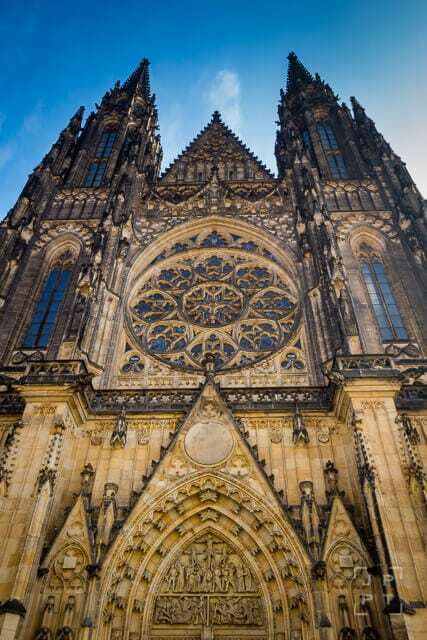 Prague Castle is the third most important landmark in Prague. This section will also cover locations fairly close to the castle itself. 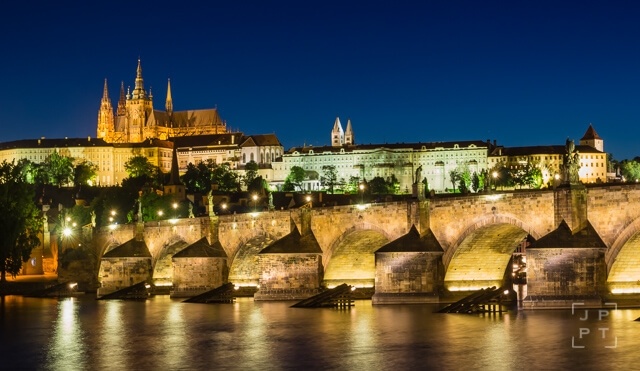 The whole Prague Castle complex is considered the largest ancient castle in the world. Nowadays, there are police checkpoints at all entrances and you have to take out metal objects from your pocket and walk through a metal detector and show the contents of your bag to police officers. This causes long queues at mid-day. Plan your visit early in the morning. Arguably the best viewpoint from the castle area offers a tremendous view of Lesser Town with its red roofs dominated by St. Nicholas Church. With this shot, you won’t have much freedom for composition as you cannot make a step backward without losing the top of the cathedral, if you step to the side you get a nasty distortion and as the cathedral is really tall, you don’t want to get closer. 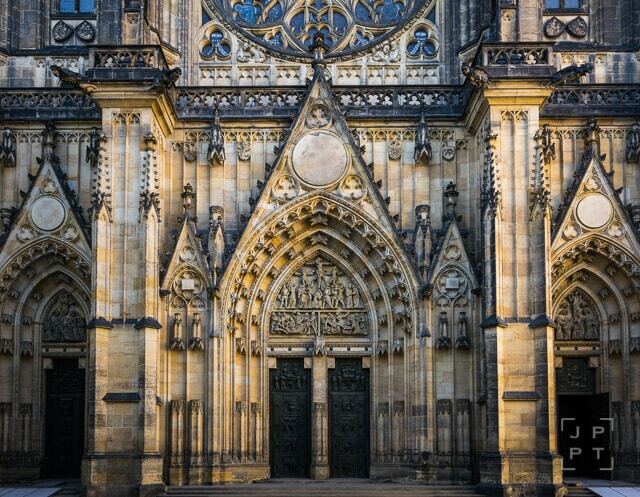 The impressive details on the front face of St. Vitus Cathedral will catch your eyes immediately. I recommend visiting in the early morning before the cathedral opens in order to get a shot without crowds of people. Beautiful colorful mosaic windows scream for attention and they truly deserve it from a photographer like you. Look for small details like symmetry. A quite typical shot that you will see on Instagram a lot. There are usually people walking around, so I tend to crop it above their heads in order to get a clear shot. Symmetry is the key here. Only up to 4 photographers can join our small group photography tour which still allows individual approach and time to improve your own photography skills. This interior location gained popularity in the recent years for its two spectacular rooms. But once you take these two pictures, you’re done. It’s like a 15-minute location. Expect to have only a minute or so to take your pictures from a tripod. Others will be waiting behind you in the line, so have everything ready before you start composing your shot. 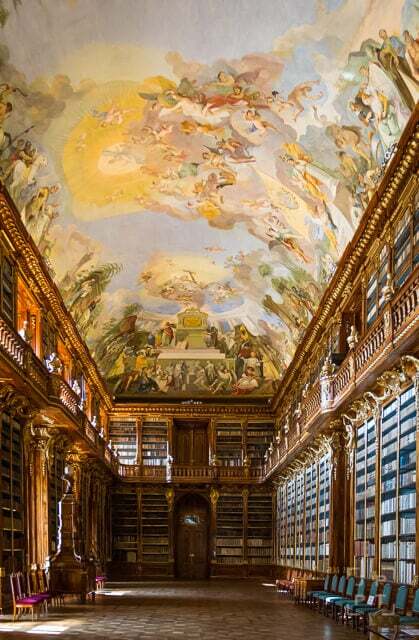 This is my favorite hall at the Library. And this is the other one worth taking a picture. This is an amazing location for a sunrise shoot! 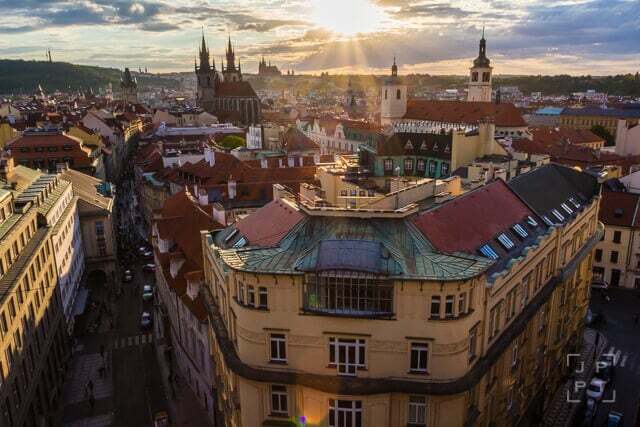 The disadvantage is that it’s located on a hill and if your accommodation is not located close to Strahov Library or Prague Castle, you have to go uphill quite a bit. 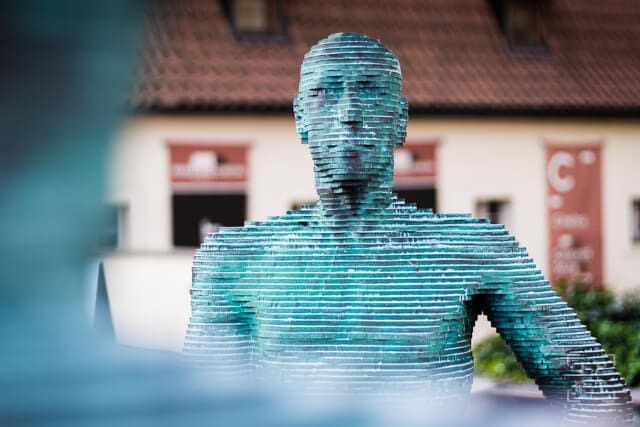 If it’s not something you are excited about, take a taxi to Vlašská 42 and from there it’s only a 2-minute walk uphill to the desired photo spot. Get here in time before sunrise and hope for some nice clouds and beautiful colors. Compose the shot with trees and include the path as your foreground element. Use your telephoto to get a spectacular view of St. Nicholas Church and the sun. 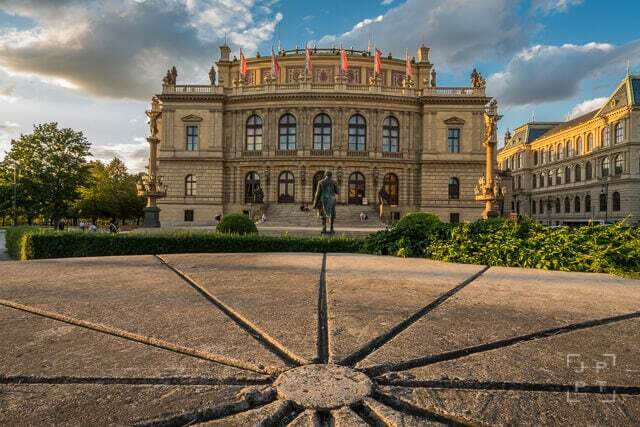 Rudolfinum is a popular concert hall that typically hosts concerts of classical music and art exhibitions. 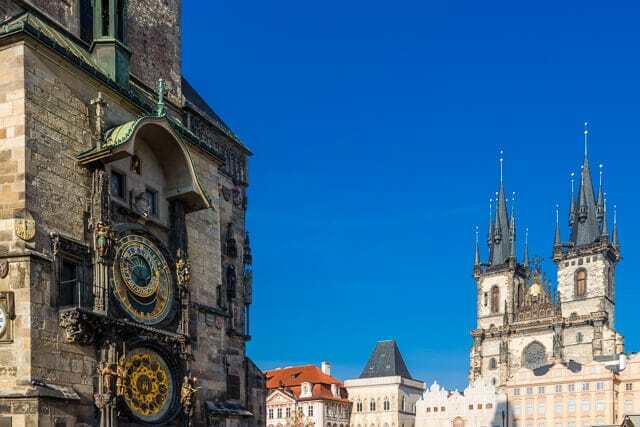 It is only a 5-minute walk from the Old Town Square or from Charles Bridge. You already know that foreground is crucial for landscape or cityscape shots. Here at Rudolfinum, there is a platform that used to serve as a mount for a statue (I believe) and it provides a great foreground with its leading lines. There is a bench nearby that you can use as a step to get up there. Don’t feel like a criminal, nobody has ever told me anything for climbing up there and I believe it’s okay. 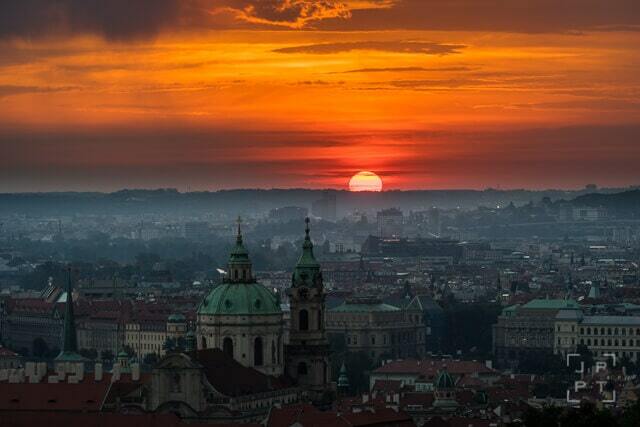 Sun sets behind Petřín hill or Prague Castle (depending on the season) and this is a good spot to take a picture from. There is a lane of benches, so you can rest a bit, too. Just another spot on the riverside to capture Prague Castle at sunset or in the soft morning light. You can try a panoramic image including the boats. Don’t forget to overlap your images by at least 30% in order to stitch it in post-processing without any troubles. 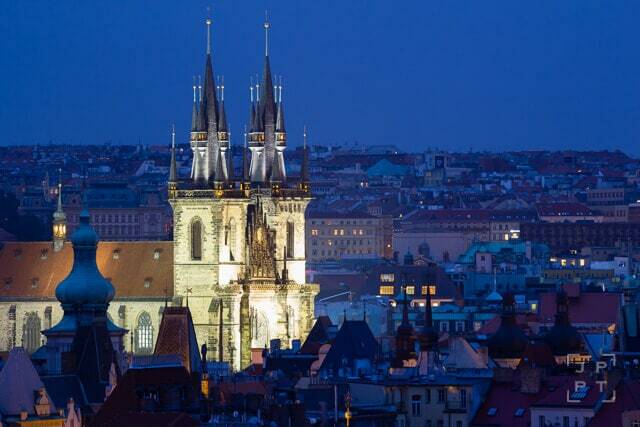 A side view gives you another opportunity to capture Prague’s most famous landmark in good light. If you shoot wide-angle, include one of the boats passing underneath (especially in the summer) to gain more depth in the shot. Use your telephoto for more detailed images of the left side of the bridge. If clouds move fast, use an ND filter and go for a long-exposure shot. 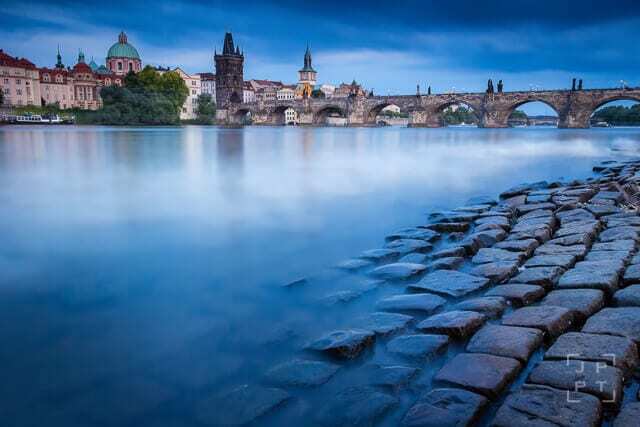 Arguably, one of the best spots for long-exposure photography Prague can offer is here. 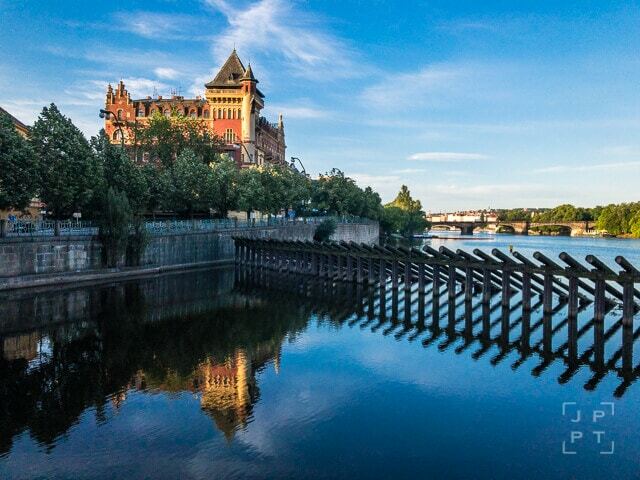 Get your camera close to the river and distinctive cobblestones to give your shot more depth. Look for leading lines. Also, this location is famous for its abundance of swans, typically in the afternoon and evening. Bring a bread you can spare and feed it to swans. If you are lucky, you may spot a nutria (coypu), a rodent looking like something between a beaver and a rat. They are friendly, don’t worry. Long-exposure photography is one of our greatest photography passions. 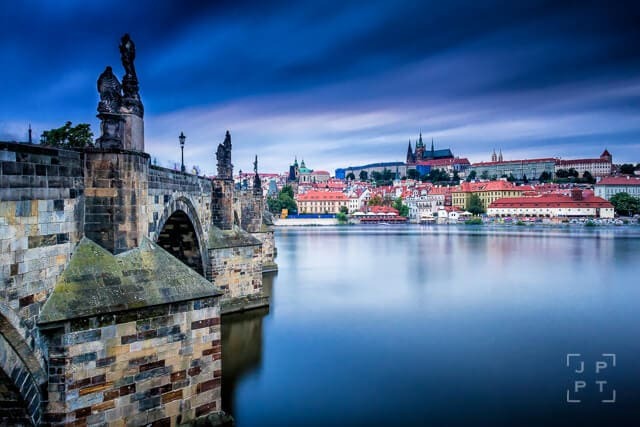 Join Jan on his Prague photo tour and learn how to work with ND filters to create your own stunning long-exposure images. Legion bridge is the other neighboring bridge of the Charles bridge and Shooter’s Island is just below with an easy access using the stairs. A nice view of light color-painted houses along Smetanovo nábřeží with reflections in Vltava river. Go with a long-exposure to enhance the reflection effect. I believe this is perhaps the best spot to photograph National Theatre from a closer distance. You get its reflections in the river and a clean, unobstructed view unlike many others. This memorial is fun to shoot and it’s only a 3-minute walk from the Legion bridge. Try to keep the background of your shots clean, use low f-stop for subject separation and keep exploring different angles. Kampa Island and its immediate surroundings are located right next to the Charles bridge and are easy to cover while shooting the bridge. This wall has recently gained a lot of popularity among tourists, especially selfie-makers. This is the main reason I recommend visiting there before 9 am when you can have the wall almost entirely to yourself. From a photography standpoint, it’s colors that make this wall interesting. It’s literally changing every week as more graffiti and rarely even art replace the old. 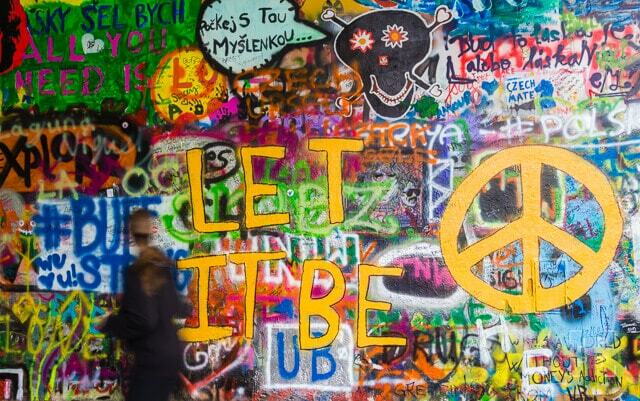 John Lennon Wall is also a great backdrop for portraits. This very narrow alley is great for shooting wide-angle images from lower view where you can accentuate the cobblestones. Walk down to the wooden boardwalk close to a bridge over the Devil’s Channel. 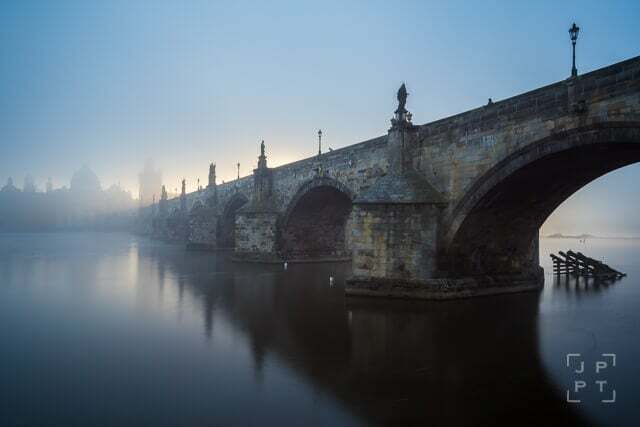 From here, frame your image with an arch of Charles bridge and enhance beautiful reflections by long-exposure technique. Exploring a city with a local gives you a whole new perspective of the city and its photography opportunities. You don’t have to wing it, join Jan’s tour and just enjoy. Here, I want to include the other spots randomly located in Lesser Town (or Lesser Quarter). 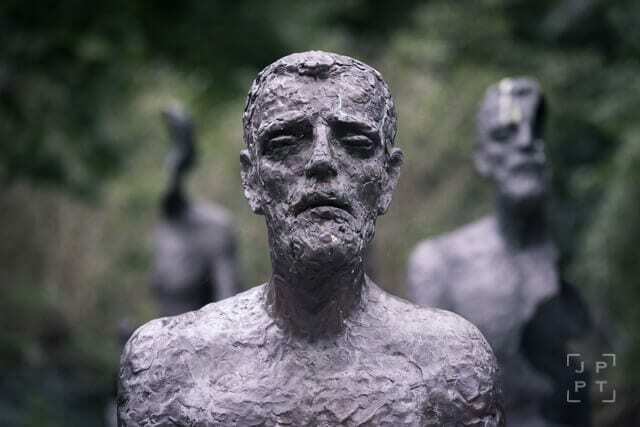 One of the most popular sculptures by David Černý, arguably the most famous Czech contemporary artist. It’s fun to see and also it has the potential for interesting portrait-style images. Try to keep your background distraction-free. Even though it’s a restaurant entrance, it still classifies as the narrowest street in Prague. It’s behind bars until 11 am (I think), but you can easily shoot through the bars. When the restaurant is open, you can notice a traffic light for pedestrians to determine whether people can enter or leave. 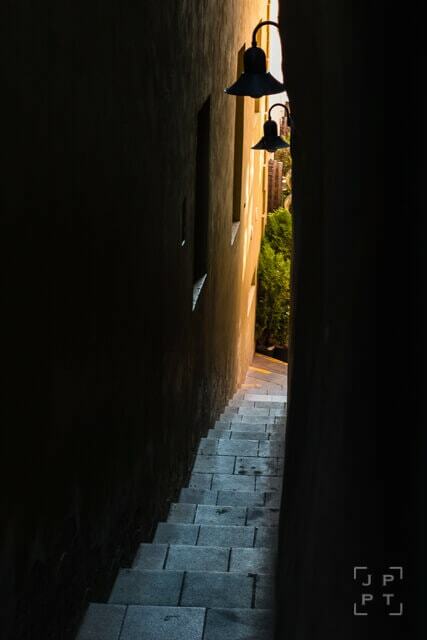 Expose for the bright light at the end of the alley and shoot from the right side to get a nice leading line in the foreground. 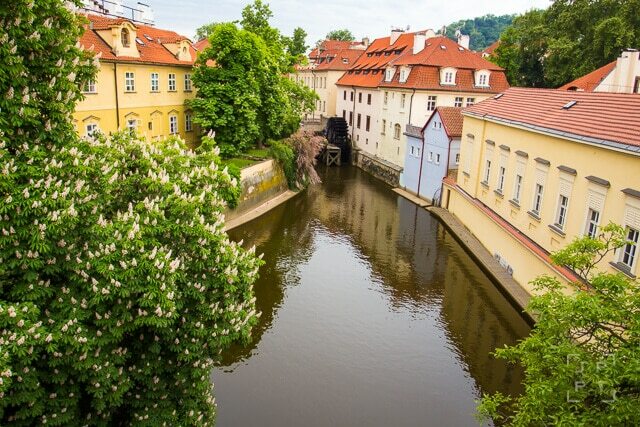 This section will cover interesting locations to photograph spread around Vltava river south from the Charles bridge. A unique example of modern art in the center of Prague designed by Frank Gehry and Vlado Milunić. This building is also sometimes referred to as Fred and Ginger. The Dancing house is not easy to photograph because of the busy intersection right in front of it. There are many tram lines that obstruct the view. However, use the traffic to your advantage and use car light trails as a leading line in your shots. The cars producing the best light trails are those that are turning to the right and go on the bridge. You will be shooting from a sidewalk at one of the traffic lights. 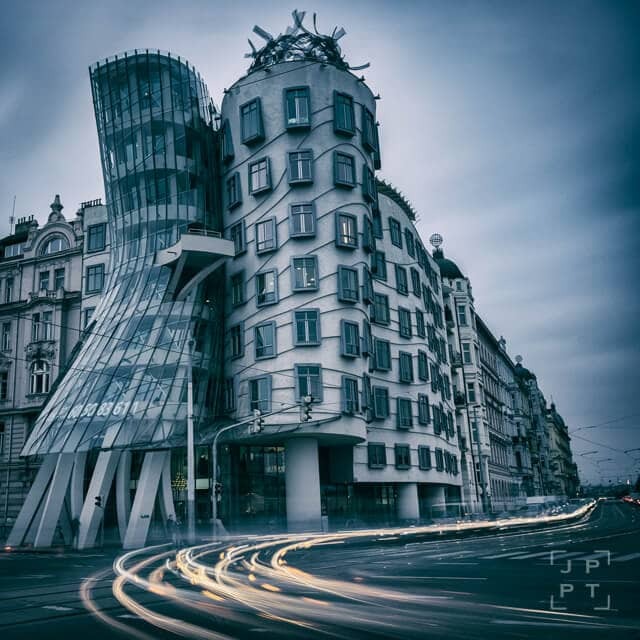 Don’t forget to shoot some details of the Dancing house. Its windows are a good subject to try. 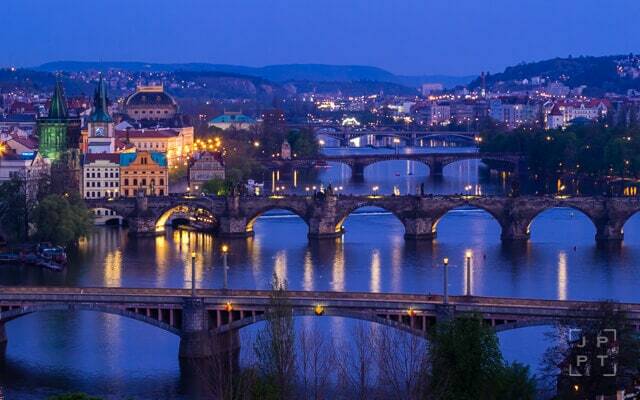 This bridge is located perhaps a 30-minute walk from Charles bridge and takes you on Prague riverside that, especially in the summer, abounds with open-air beer stands and is a popular place to hang-out mostly among a younger crowd. Capture the bridge with some boats anchored here, use a strong foreground element and experiment with both vertical and horizontal framing. You can get on a bridge from the main road. Shooting from a tripod can be a challenge if many people are passing or the trains go regularly. If the intervals for either is too short, just raise your ISO. Congratulations for reading this far! Book your photo tour with Jan if you want Prague photography expert to accompany you on your photography experience in Prague. 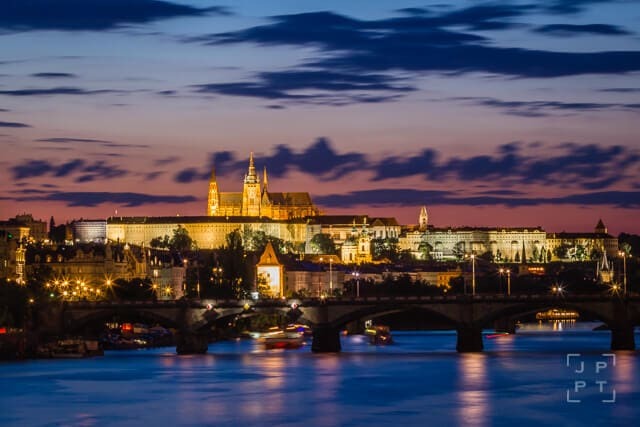 If you are looking for more information, have a lot at these articles that give you additional information on the most photogenic locations in Prague. 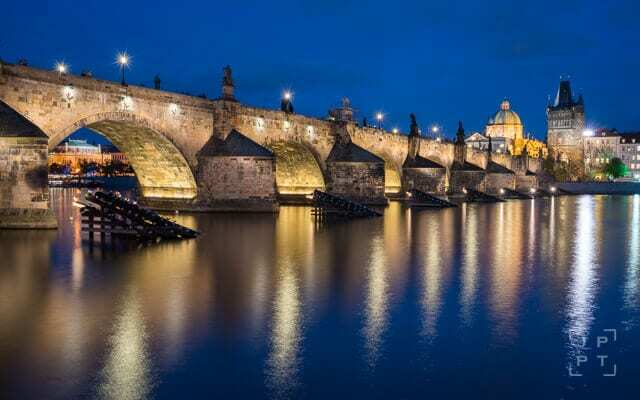 This article strives to be an ever-green, always-updated and constantly-expended blueprint for landscape and travel photographers coming to Prague. I hope you will find it useful and informative. If you did, come say hi in the comments. If you want to make it even better, feel free to send me tips on new spots by e-mail or share them in the comment section. You are more than welcome to share the article with your friends or your local photography community. 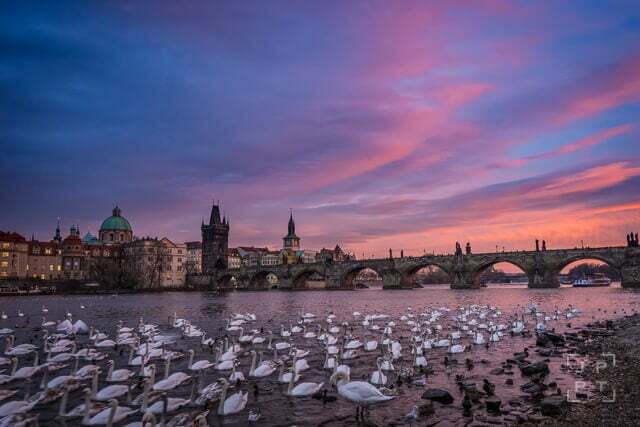 If you prefer to explore the city with a local photographer Jan, check out his Prague photo tours for both small-group tours and private customized photo tours tailor made to your specific photographic needs. This is an amazing guide!!! So many nice spots, with very useful and detailed information to get there. Thanks a lot for sharing this knowledge! Well documented. Usually photographers consider sharing location details and time of the day, as their trade secret, which you have publicly shared. Great!!! This article is GOLD. Thanks for sharing such amazing information. Hey, Jan. Do you use Instagram? Would love to connect with you there. Hi Vineet, you can find me on my personal Instagram as @janmiracky and you can follow pictures from Prague on my @johnnyspraguetours IG. Thank you! Thanks for sharing. What a great site !! Thank you so much for this great guide. Makes things so much easier for photographers. And your photos are great! Awesome article. Thank you so much for sharing. I will be visiting Prague soon so this is very helpful. Jsem rozeny Prazak, ale nebydlim tu uz pres 50 let…. what a wonderful way to explore the magic of Prague again. You´ve done a great service to thousands of photographers. Not only you have shown us where to go but also how to get the best of the best. And you were happy to share your secrets. Klobouk dolu, Jane. May the Force be with you! Fantastic guide, gutted you will not be about when I travel in march would have been nice to have the tour.